The reigning Super Bowl Champions, the Seattle Seahawks, are set to defend their title against the New England Patriots at Super Bowl XLIX in Phoenix, Arizona on February 1, 2015. Seahawks owner Paul Allen has to be thrilled about this development, and the chance to have back-to-back Super Bowl Championships under his belt. There is one area, however, where Allen doesn't need to compete with fellow NFL owners, his personal net worth. After Allen, the next three NFL owners with the most wealth don't even come close to that of Allen's. St. Louis Rams Stan Kroenke, Miami Dolphins Stephen Ross, and Tampa Bay Buccaneers late Malcolm Glazer (who passed away in 2014) have a COMBINED net worth of $14.6 billion. So with a net worth of $20 billion, the Microsoft co-founder is not just one of the 30 richest people in the world, he is by far the wealthiest NFL team owner. That's a far cry from where Allen was in 1975, when as a college dropout, he and his high school classmate Bill Gates were creating a line of software for the newly-born personal computer industry. That software, dubbed Micro-Soft, was the bedrock upon which one of the world's most valuable corporations would be built. Paul Allen and Bill Gates met in high school while attending The Lakeside School in Washington State. Despite their two-year age gap, they became fast friends who got their start programming and hacking, thanks to the access they had to a mainframe system owned by their school. The school infamously bought what it expected would be a year's worth of time on the mainframe, only to find Allen and Gates had used up that time in just three weeks. Soon, Allen was finding ways to sneak into computer labs and logging in as an administrator. Allen even passed himself off as a graduate student at the University of Washington so he could get in some extra programming time. Eventually, he was caught and banned from the lab. Allen and Gates pressed on however. Their big break came when they saw an article about the Altair 8000 in Popular Electronics Magazine. The computer was small and inexpensive, and was ideal for home computing. The two men got in touch with the computer's manufacturer and offered to design a programming language for the Altair 8000. That language was called BASIC, and it's development opened their eyes to the potential opportunity that existed in creating a programming language. Oh, and yes, they designed it for a computer they not only didn't own, but one they had never even seen before. Incredibly, it was a success and their language worked. Paul Allen co-founded Microsoft with Bill Gates in 1975. It was Allen who eventually dubbed their venture "Micro-Soft". They trademarked the shortened version "Microsoft" on November 26, 1976. When Microsoft officially incorporated in 1981, Steve Ballmer owned 8% of the company, Paul Allen owned 25% and Bill Gates owned 45%. The remaining 22% was split up among some of the luckiest people ever to join a risky young startup. Microsoft IPO'd on March 13, 1986. Microsoft ended the day with a total market cap of $780 million. Gates' 45% stake was worth $350 million. Allen's 25% stake was worth $195 million. Ballmer's 8% stake was worth $51.5 million. As we all know, over the next 30 years Microsoft ballooned into one of the largest and most valuable companies on the planet. Paul left Microsoft in the mid 1980s after a management dispute with Bill Gates but he stayed a member of the company's board of directors until 2000. Even despite his relatively early departure, his enormous wealth allowed Paul to finance an impressively lavish lifestyle of mansions, super yachts, private jets, and several pro sports teams. His most recent project involves commercializing the space travel industry. Over the years, Paul invested proceeds from his Microsoft shares into his private venture firm, Vulcan Capital. Today, Vulcan owns both the Maaco and Meineke car care brands. It has developed nearly 7 million square feet of real estate, and was a founding investor in film studio Dreamworks SKG. During his life, Paul Allen gave more than $2 billion to charities focused on brain science, and music and arts education. Paul's financial assets are no longer solely related to the tech industry. He owns three professional sports teams, including the Seattle Seahawks and the Portland Trailblazers. He purchased the Seahawks in 1997 for $194 million when former owner and real estate developer Ken Behring threatened to move the Seahawks to Southern California. Since Allen has been at the helm of the Seahawks, he has built a new stadium, hired former USC coach Pete Carroll, won a Super Bowl, and generally worked to please a legion of fans considered to be among the most rabid of hometown bases in the NFL. Today, the Seahawks are worth $1.3 billion less than the other three teams that played in the NFC and AFC championship games this season. There are many other examples of how Paul Allen has used the wealth Microsoft has provided him to pursue other interests. He is involved in many philanthropic and entrepreneurial endeavors. In 2003, Allen founded the Allen Institute for Brain Science. His goal is to better understand both the diseased and the healthy human brain. In 2013, the Paul G. Allen Family Foundation granted $2.4 million for a study aimed at gaining a better understanding of traumatic brain injuries. This, of course, is a subject of great interest to an NFL owner, as concussions have become a serious problem for football players at all levels. In addition to the Seahawks, Allen owns a number of other professional sports teams, including the NBA's Portland Trailblazers and the soccer team, the Seattle Sounders. 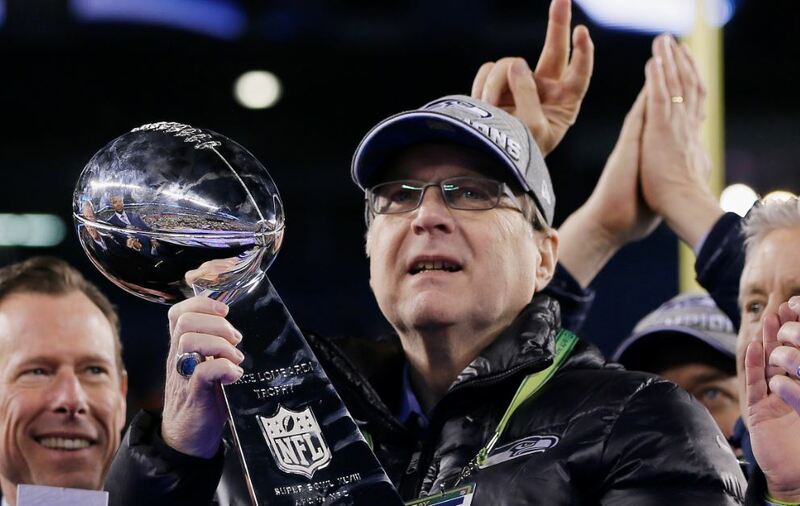 It may seem odd the co-founder of a technology company has such an interest in sports, but then again, if Paul Allen has a true talent, it is being able to defy everyday conventions. Last summer, he and his band, The Underthinkers, released their debut blues-rock album, Everywhere At Once. Allen plays a mean electric guitar and does so with friends like Joe Walsh of the Eagles and Chrissie Hynde of the Pretenders. Paul Allen truly lived a truly incredible life. He was a tech entrepreneur, space travel enthusiast, certified scuba diver, friend of Bono, and owner of the three pro sports teams. It was fabulous life, and that is evident in every facet of his activities in business and other ventures. Allen's life story makes you think back and remember all of the underclassmen at your high school you may have misjudged, and perhaps should have been nicer to. You never know, having been a bit more friendly and outgoing just may have put $20 billion in your bank account and a couple of professional sports teams in your portfolio!